The Passive House Standard is really energy efficient, cost effective, comfortable, affordable and sustainable. Have a look at some examples: Passive Houses - examples. 17 years experience from the very first Passive House. American visitors: Want to convert to US-units? Find a convinient tool here: The Passive House Sliding Converter! Passive Houses save energy - not only based on calculations, but also in real life. This figure shows energy consumptions measured in standard buildings, in comparison to low energy houses and Passive House settlements. You find detailed measured data on consumption of Passive Houses on this page. Passive Houses are sustainable. This is the reason, why the resolution of the European Parliament from January 31st 2008 calls for Passive House standard in all EU states from 2001. 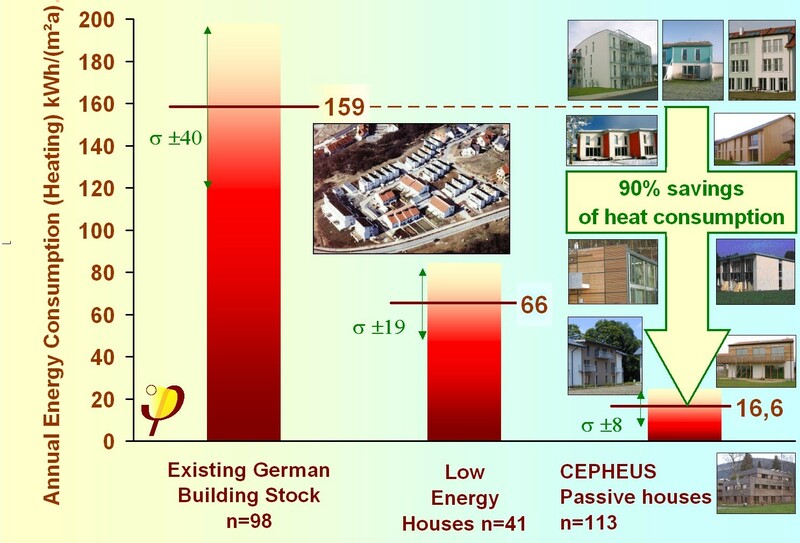 In 114 Passive Houses of the European CEPHEUS project (far right) an average saving of 90% was monitored. By using a harmonized concept a new quality is achieved. The Passive House is economically justifiable through the achievement of high comfort, healthy indoor air quality and affordable construction costs. You want to have information about imbedded energy? Paper on the life cycle analysis for free download: Primary_Energy_Input pdf 322 kB. The concept is open to everybody. See, how an ordinary row house can be step by step improved to become a Passive House. Up-to-date results from monitored Passive House projects will be presented in workshops of the 2008 conference. All presentations will be in English or will be translated to English simultaneously. Read more about the International Conference on Passive Houses 2008-04-11/12: www.passivhaustagung.de. The Passive House is the world’s leading standard in energy efficient construction: Energy saved on heating is 80% compared to conventional standards of new buildings. The energy requirement for heating is lower than 10 to 20 kWh/(m²a) (depending on climate), adding up to a low cost of 10 to 25 € per month. Therefore high energy prices are no longer a threat to Passive House occupants. Exceptionally efficient components and a state of the art ventilation system, achieve these huge savings without compromising comfort, but rather increasing it. Contemporary construction is quite airtight, therefore the air replacement from infiltration is not sufficient. Ventilating by opening windows is not a convincing strategy either. Getting a sufficient volume of fresh air is not just a question of comfort, but a requirement for healthy living conditions. Therefore mechanical ventilation is the key technology for all new construction as well as refurbishment of existing buildings. Mechanical ventilation will work in all cold and all hot climates since in an airtight house, the heating and cooling energy required will be significantly less. Even though mechanical ventilation systems raise initial investment costs, if designed efficiently they will reduce energy costs significantly, eventually paying off the initial cost. Ventilation units suitable for Passive Houses allow for an economic operation. Now we explain the central "trick" of the Passive House concept: The fresh air needed is entering the room anyhow. If one could use this air to cover the heating load, without increasing the mass flow, without recirculated air, without noise and without drafts - then the ventilation will pay off a second time. This concept of "fresh air heating" is only possible in a building with superior thermal insulation, just like a Passive House. For experts: This is the defining requirement; the maximum heat load should be lower than 10 W/m² , allowing the fresh air to carry the heat load. To realise an optimal interaction of all components, an energy balance of the building has to be worked out. And step by step any new design may be improved to meat Passive House standards. A tour of built examples will take place place on April 13th, 2008. Podcast on Passive Houses: The Passive House. Additional information about the Passive House concept.